Cambria Torquay is engineered quartz and she looks like White Carrara Marble or White Fantasy Granite. I would like to mention all the stones with feminine characteristics like Rudyard Kipling who had been animated all the objects in his poems. Many homeowners can pick Cambria Torquay. Manmade stone looks like marble is a big plus for the kitchen remodeling process: Easy to maintain, non-toxic and non allergenic and durable by having the unique beautiful look of marble. In this condition she is definitely a better alternative than marble for the decision of countertop part. Assuming your choice is a stone countertop, I would like to give you a little hint to make a comparison with marble and quartz. Kitchen countertops can be natural stone or man made stone. By comparing marble with Cambria Torquay, Marble is a metamorphic rock. Metamorphic rocks are more fragile, vulnerable to stains and permeable to keep the liquid in their body. Marble is very porous on the surface. Since she has a risk of break down and staining, marble is not a good choice at all. On the other hand, the glamour of Cambria Torquay can be seemed in the first sight. She has the same visual pattern of White Carrara Marble and her amazing look makes way of expensive than the other man made stones. If you would like to have Cambria Torquay, you should stick the all white, gray, brown and black tones for traditional and contemporary kitchens. If you are seeking some modern look, Cambria Torquay goes for red, blue, yellow cabinets. She is capable to make very good connection with those colors. For two tone cabinet lovers, Cambria Torquay is an excellent candidate for kitchen remodeling ideas. 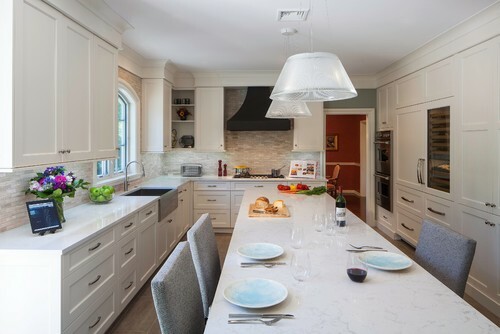 Picture Credit: Hometech Renovations, Inc. via Houzz., Contemporary two tone cabinets kitchen glamours with Cambria Torquay Island Top and Countertop. I focused on the magnificent Waterfall edge island top . Backsplash is an opaque glass paper faced tile from Ocean Side Collection.The shape of backsplash is honeycomb. Porcelain flooring tiles are from linen collection. White and Cappucino Cabinets are coordinated perfectly. Very inspiring design. Picture Credit: Renaissance Granite & Quartz., Cambria Torquay countertop and island top with stainless steel appliance and bliss cappuccino random brick glass stone mosaic tiles, cappuccino cabinets. Amazing colors in modern looking. Sphere clear glass kitchen pendants are big plus. Picture Credit: Redbud Custom Homes., Stunning backsplash combination. Water Jet Series Claridges Collection from Artistic Tiles bordered with white carrara marble rectangle tiles. Stainless steel hook and appliance give an heavenly gloss. Cambria Torquay over hang island top and counter top match perfectly with other design elements. Cambria Torquay with Hand Made Off White Subway Tiles, Walnut and Off White Two Tone Cabinets and Clear Walnut Stain Flooring. Overhang Raised Breakfast Island Top is Bonus. Picture Credit: INVIEW Interior Design., Think about a clear walnut stain stage and think about the dancing couples. Walnut cabinets are males and off white cabinets are the females. All wearing matching whites and dancing happily. Two tone cabinets and off white hand made subway tiles are the best choice on walnut flooring and Cambria Torquay. Cambria Torquay Double Ogee Laminated Edge Tabletop , Countertop, White Cabinets, White Glossy Subway Tiles and Stainless Steel Pendant. Picture Credit: Julie Williams Design., Beautiful Traditional Kitchen Style with rich taste. Double ogee laminated edge Cambria Torquay Table Top, Colombia PP470 Cabinets with Iceberg Paint, IC 3×6 Brights in white gloss subway tiles and Hudson Valley Stainless Steel Pelham Pendant.